By using steam, this front-loading dryerís TrueSteam technology claims to get rid of wrinkles and odors on clothes. With its 9 drying programs including SteamFresh and SteamSanitary, choosing a setting that will suit different fabrics is easy. A sensor called the FlowSense Indicator monitors lint buildup and airflow blockage. For regular loads, choose a drying program that will meet the fabricís needs. A Normal setting will generally dry everyday clothes like cotton shirts, and for denim jackets and jeans, the Heavy Duty setting will do. Undergarments can be dried using the Delicates or Ultra Delicates settings, while non-tumble dry items like shoes and stuffed animals can use the Rack Dry option. For laundry that needs freshening up, the SteamFresh program will be useful, and the SteamSanitary program is for cleaning and deodorizing items that are not machine-washable. The dryerís FlowSense Indicator checks lint buildup on ducts and filters as each cycle starts, while the Sensor Dry System prevents half-dry laundry by adjusting the temperature and drying time as needed. The Ultra Capacity NeveRust Stainless Steel drum has room for more clothes for lesser loads. A drying rack is installed inside the 7.4 cubic feet drum. The electronic control panel consists of the Dial-A-Cycle knob and one-push buttons. The option buttons include the Child Lock setting, End of Cycle and Damp Dry switch. Equipped with a tri-lingual LCD display, the upfront navigation panel also shows the program settings and remaining time of a cycle. Choose whichever way the door opens with the fully reversible hinge. The door is made of clear, tempered glass and then framed with chrome to add substance. This large, circular door sits right below the electronic control panel for ease of use. Aside from the unitís four leveling legs, a drawer pedestal can be used to elevate the dryer. To save more space, stack the dryer unit on top of a matching washer with the optional stacking kit. Both the stacking kit and pedestal are sold separately. The 27-inches wide dryer cabinet is made of painted steel. The unit comes in Pure Silver, White and Wild Cherry Red. Its electrical requirements are 120V and 15 Amps. The dryer comes with 9 programs and 10 options. With its Ultra Capacity drum, the drum accommodates large pieces like blankets. The EasyIron setting moistens the laundry for efficient ironing. Static cling on clothes is minimized with the option called ReduceStatic. The SteamFresh program refreshes the laundry. The SteamSanitary program deodorizes and disinfects non-washable items such as decorative pillows. The FlowSense Indicator alerts you if the ducts needed cleaning. Up to 95% allergens on clothes are removed. Dryer settings are automatically adjusted by the unitís Sensor Dry system. The LCD display has English, French and Spanish options. It offers no-spin drying with the built-in drying rack. 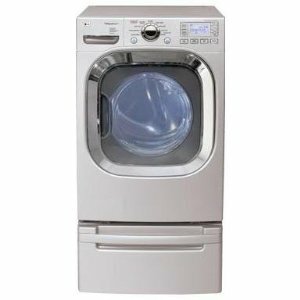 The SpinSense minimizes excessive dryer vibrations. The LoDecibel system allows quiet drying. The drum is made of a rust-proof material. A stacking kit is available to help save space. The unit takes time to dry thick items like comforters. With its average $1,350.30 price, this model is more expensive compared with other units with the same features.